Part of being Pinoy is eating on the streets. Not dining out on a restaurant with chairs and tables out on the streets, no not something as fancy as that. Eating on the streets is standing on the "kalsada," while everyone seeing you munching something sold by an illegal vendor. The background music is the noise of charging jeepneys and revving tricycles, dust blowing around you...and your food. Pero yun ang nagpapasarap dun! We love eating. We love eating food high in cholesterol. We eat the innards of chicken, pig and beef! We eat fried flour mixed with a little bit of fish or squid or chicken dipped in spicy sauce that probably could cause hepatitis. We eat would be ducklings, sometimes with some feathers and beaks! But man, this is the Pinoy experience! 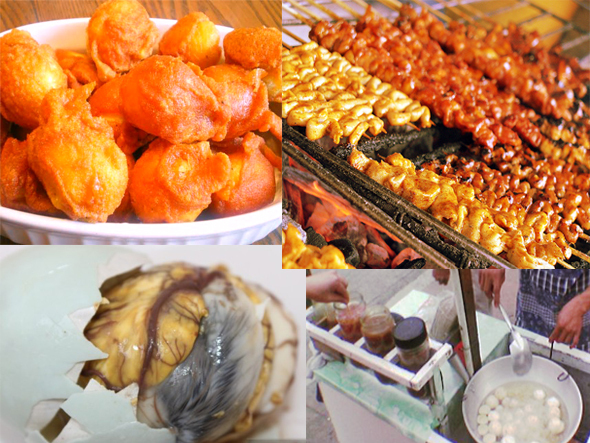 Every Filipino knows kwek-kwek, balut, isaw, and fishballs. You are not Pinoy to the core if you haven't tasted these.